Electrolysis hair removal is the only method approved by the US Food and Drug Administration (FDA) for permanent hair removal, and has the best result over any other method for removal of hair for a long period of time or even permanently. Electrolysis is a technique can be effectively performed for permanent hair removal only by a professionally trained electrologist. Electrolysis ensures no pain other than a tickling sensation and the insertion of the probe tip will not even be felt. The electrolysis procedure destroys the root of the hair from the follicle instantly, leaving no mark or scar without damaging the skin. The time required for permanent cure depends on the intensity of growth of the unwanted hair. For a person with moderate growth will require anywhere between 15 – 30 sessions of one-hour duration. Therefore a considerable amount of time and patients are required for a successful permanent cure. The greatest advantage of electrolysis is that it has no side effects Is electrolysis a safer technique? Irrespective of color of skin or hair electrolysis technique can be applied to anyone because it attacks the hair follicle itself and not the pigment in the hair. Only procedure available for permanent hair removal and only procedure which works on gray hair. Which are the body Parts where scientific electrolysis can be successfully applied? What are the home procedures for after care treatment? Immediately following treatment, your Electrologist will gently cleanse the area and apply a mild astringent (without alcohol) and a healing cream. Do not touch with bare hand the treated areas for 24 hours. Dip cotton in lukewarm water and wipe the area gently three times a day for three days. Do not apply makeup or any cosmetics for three days. Advantages of Permanent Hair Removal In Banjara Hills, Hyderabad? This method safely provides permanent hair removal in Banjara Hills, Hyderabad at Asmara on all skin types and all shades of skin pigmentation & can be done during pregnancy. Remember, with this method, you are getting the hair permanently removed. Unless you have an ongoing hormone/medication problem or choose to get additional areas treated. Electrolysis and laser For Men – Safe, Effective, and Permanent! Permanent hair removal in Banjara Hills for men of all ages and skin types. We have many male patients and understand the needs of the male customer. Shaping a beard makes a neatly trimmed beard exquisite. It helps to minimize skin irritation from shaving and reduce the amount of care needed to maintain a beard. As men age, ear hairs get increasingly coarser and longer, this makes shaving or other temporary methods very difficult. 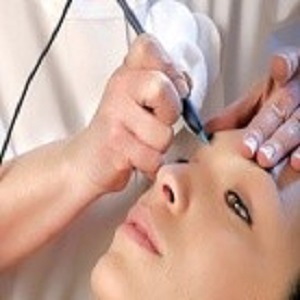 Bushy eyebrows are uncomfortable to maintain and trimming can be dangerous. Some men grow coarse hairs on the ridge of the nose. This condition can affect men who work outdoors. Body builders, sportsmen, and swimmers find body hair very discomforting. Laser is termed as Light amplification stimulated emission of electromagnetic radiation, where so many lasers are present in the market. 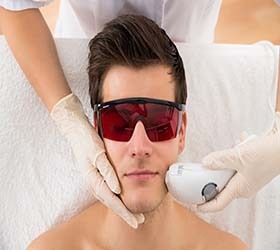 But Laser Hair Removal In Banjara Hills, Hyderabad at Asmara we use a diode laser which is the gold standard for hair removal, with good safety profile pain free. How does Laser Treatment For Hair Removal work? Diode laser has a wavelength of 808 NM where it targets the pigment of the hair follicle creates a reaction and destroys the follicle in the active stage of the hair cycle. I.e. ; Hair cycle has many stages. It works better on darker and thicker hair. How many sessions will I require to Laser Hair Removal? As laser works on the active stage of the hair cycle, all the hair follicles don’t remain in the same stage. It requires multiple sessions. It doesn’t target the lighter pigmented hair, here comes the role of Electrolysis. Advantages – Laser Treatment For Hair Removal In Banjara Hills, Hyderabad? 3) Large areas can be done. All laser treatment for Hair Removal In Banjara Hills, Hyderabad at Asmara will be performed by a doctor for your safety every time.